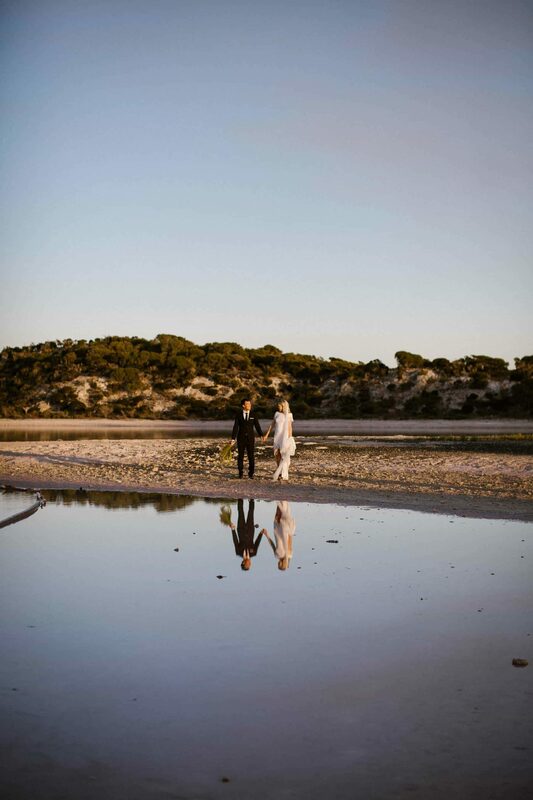 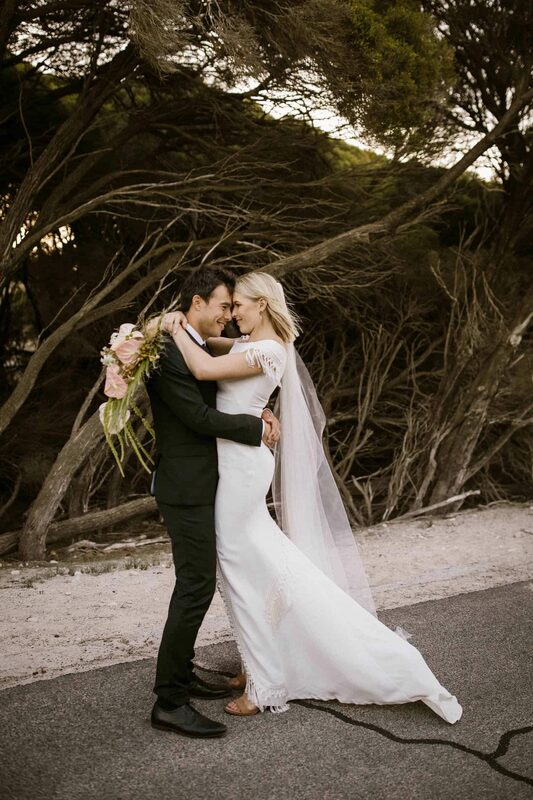 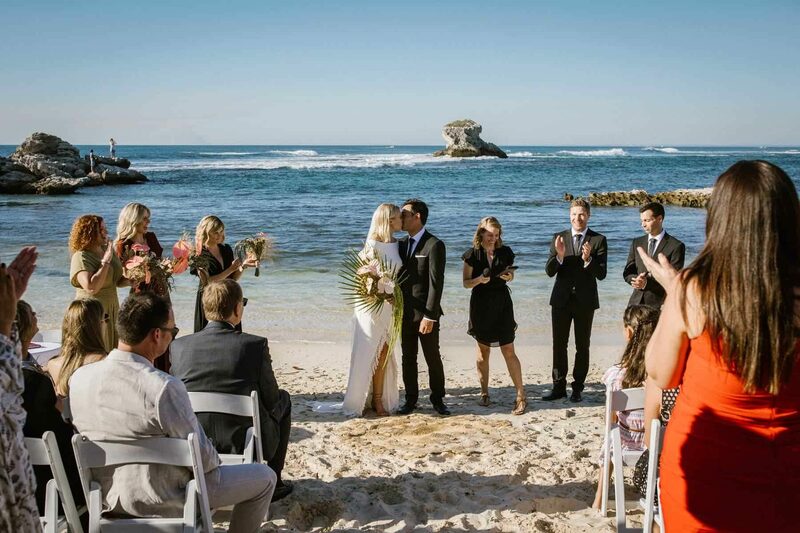 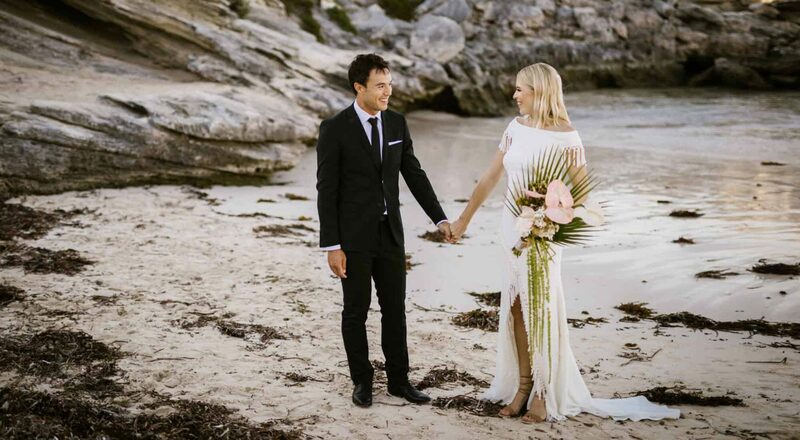 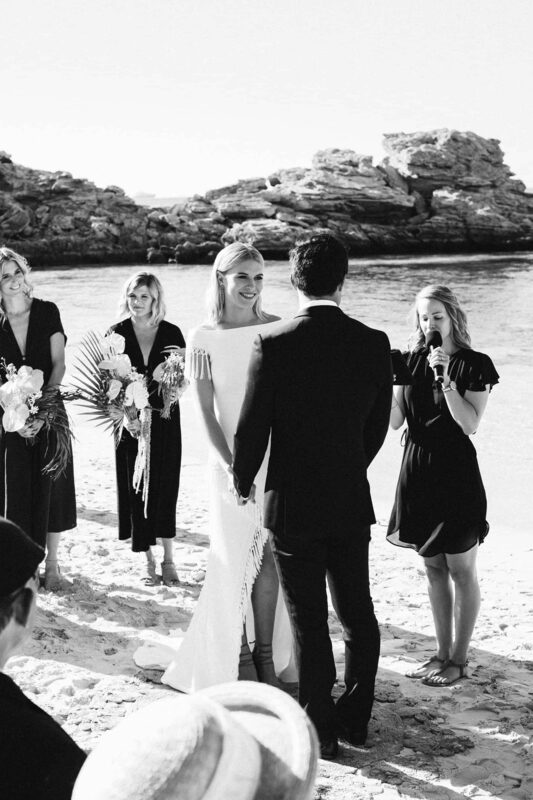 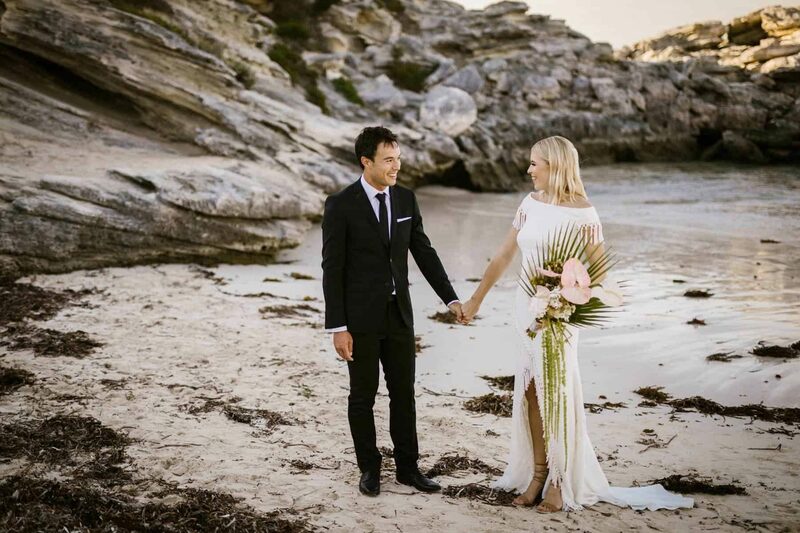 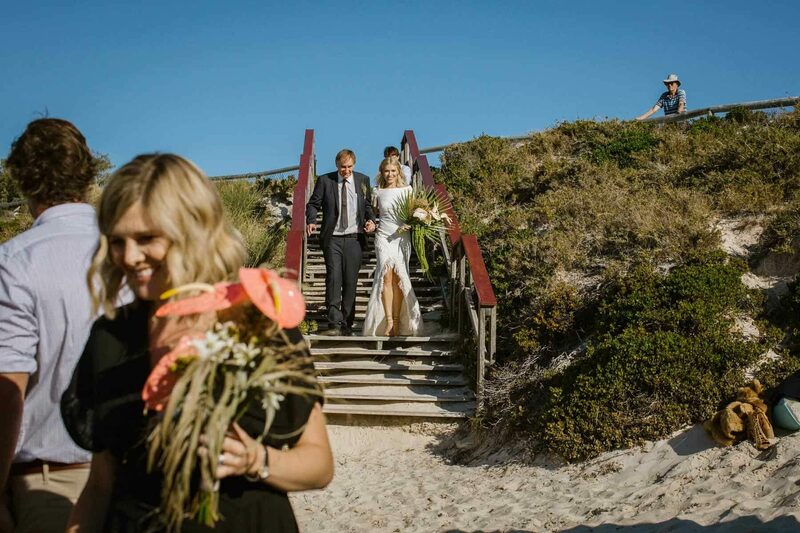 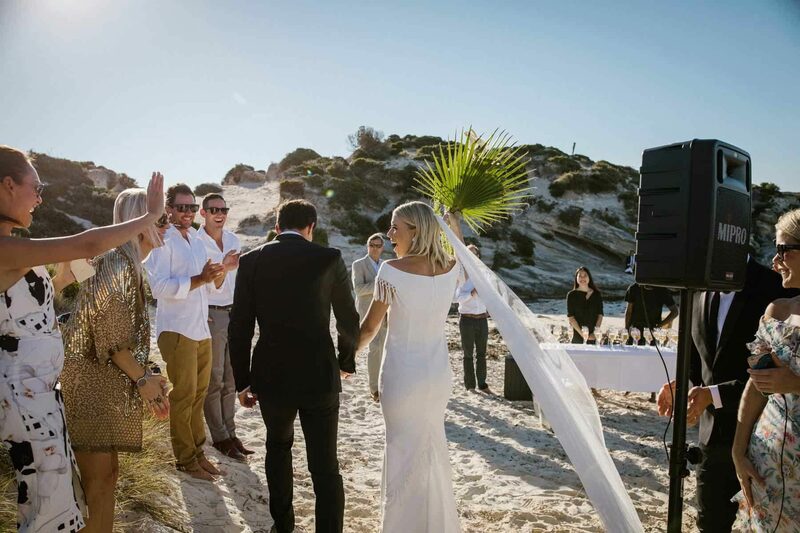 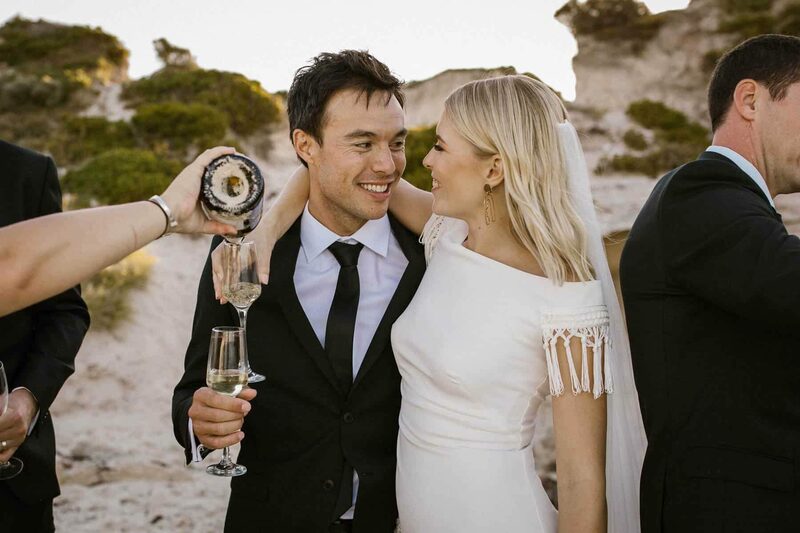 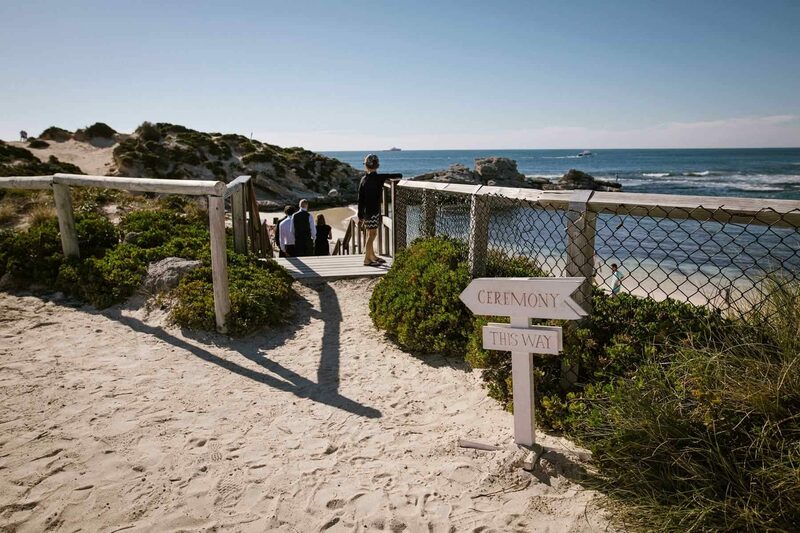 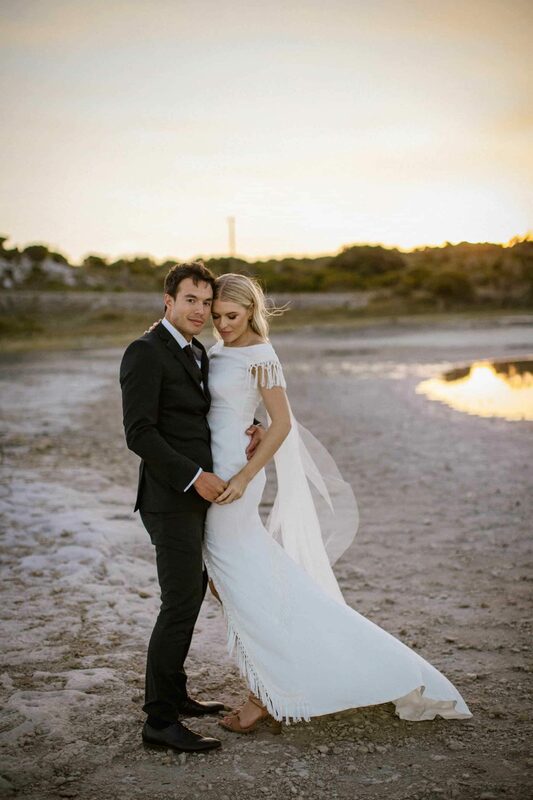 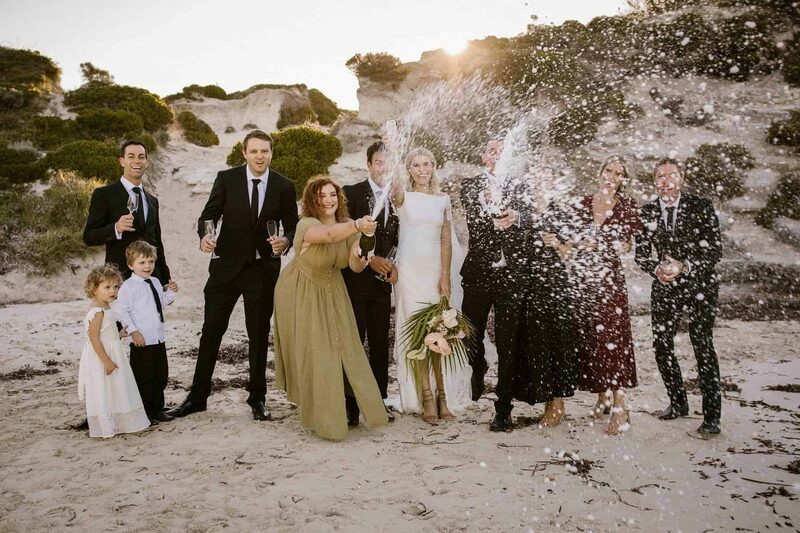 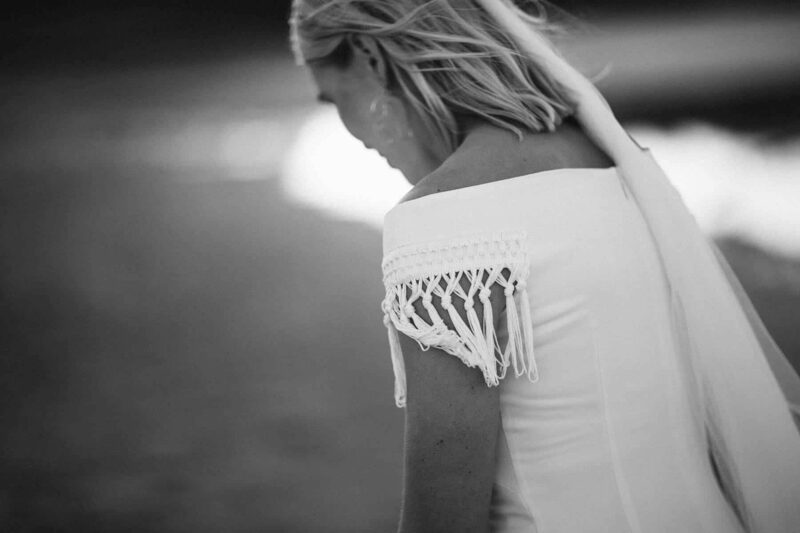 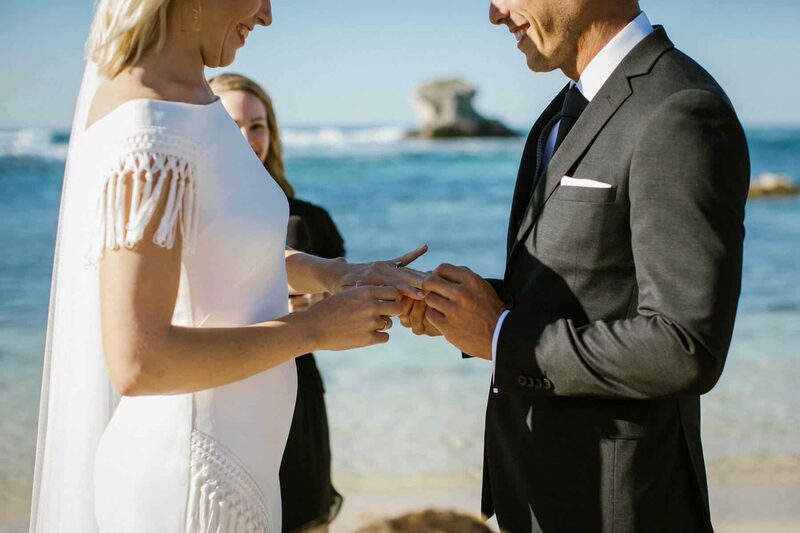 Nestled between the beach shacks and sparkling shorelines of Rottnest Island, Lara and Steve found the perfect little bay to throw their not-so-typical beach wedding. 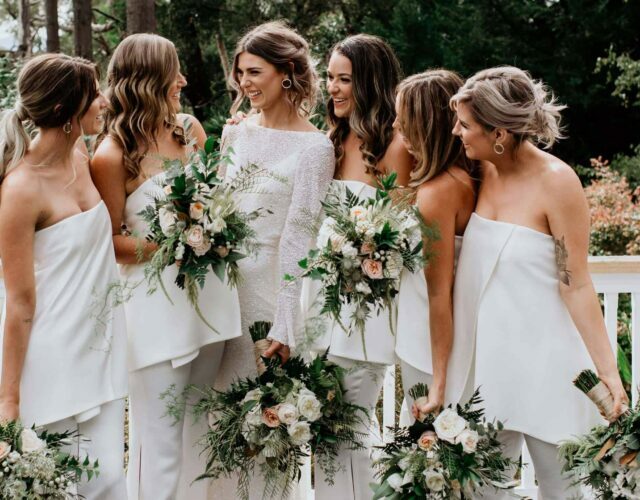 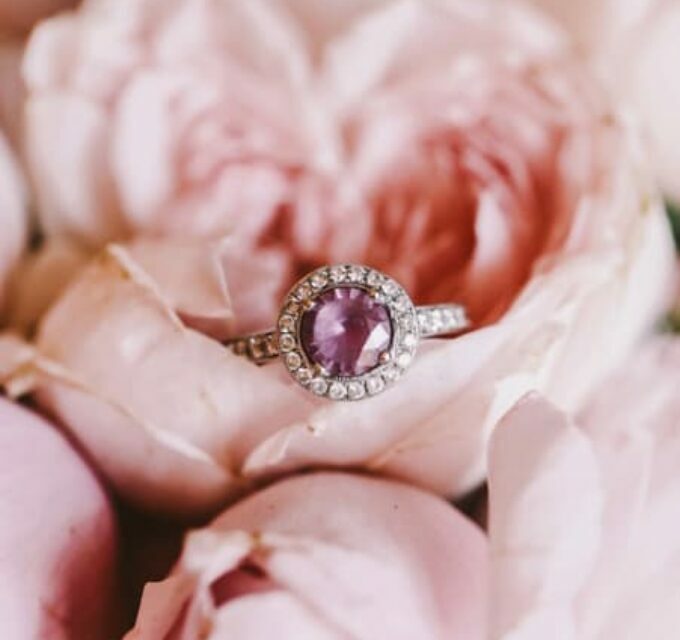 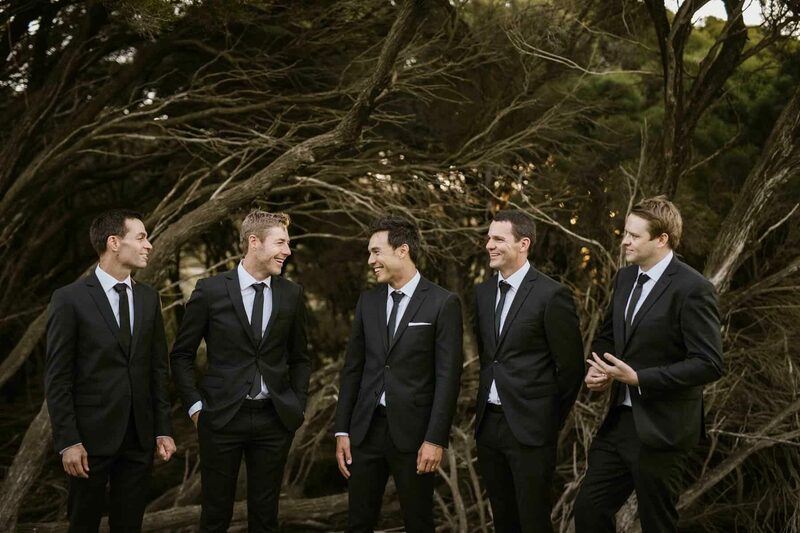 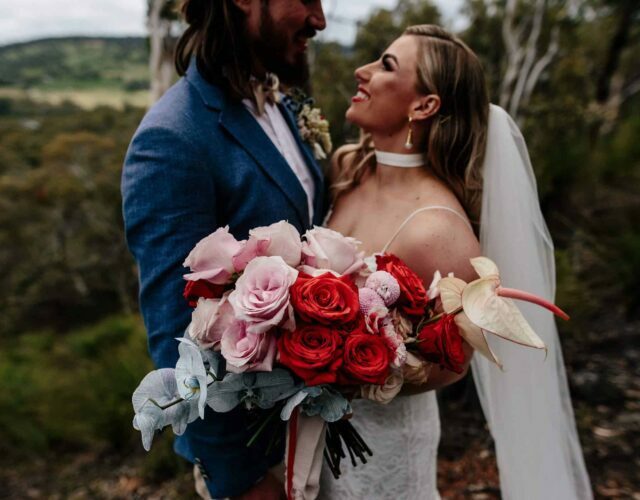 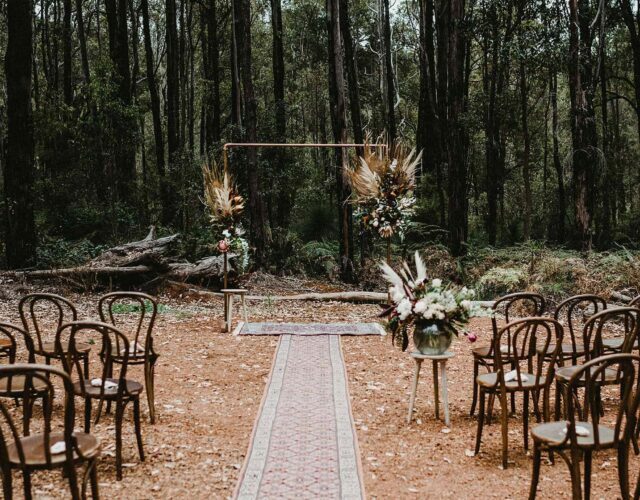 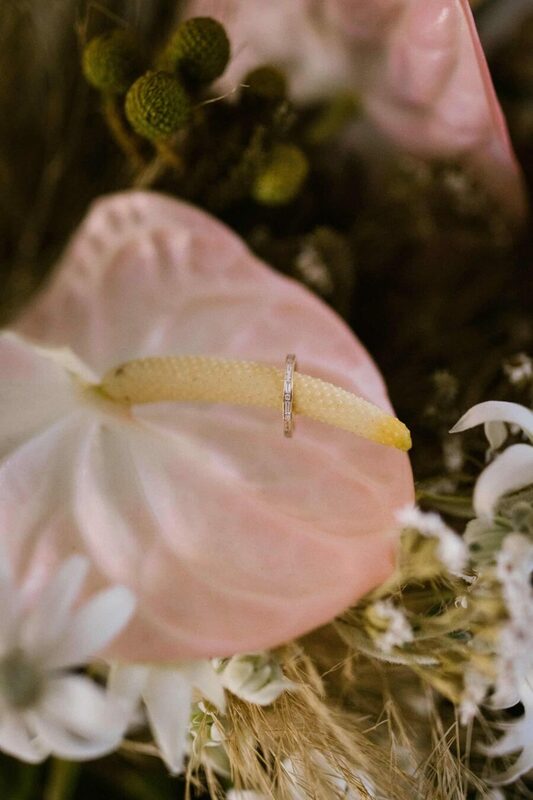 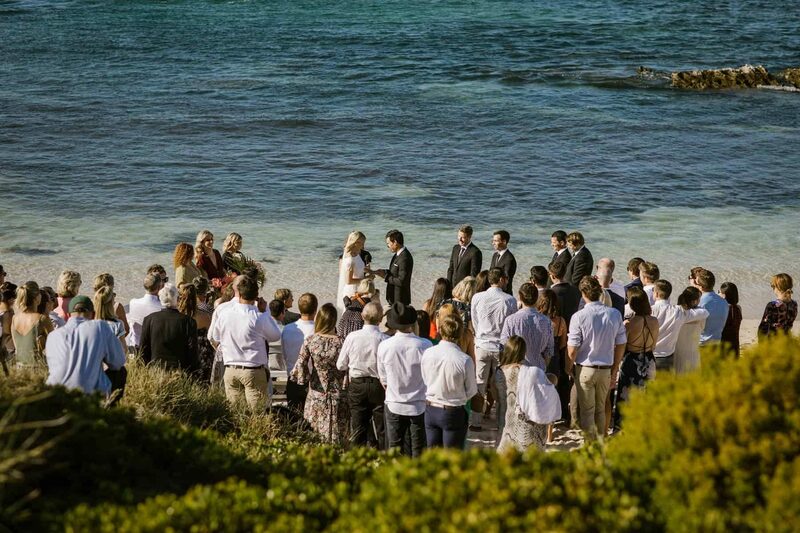 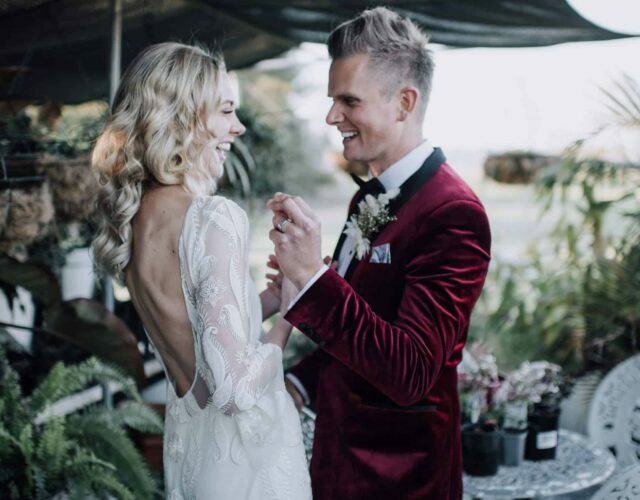 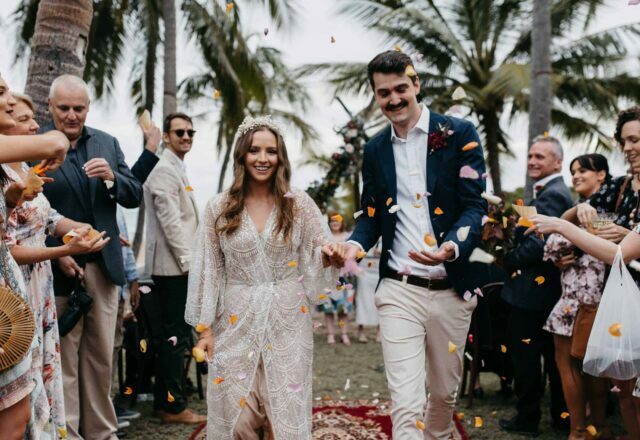 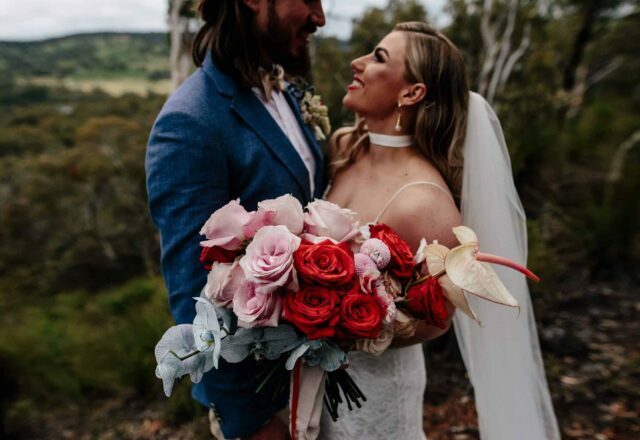 Their intimate ceremony in a truly untouched setting was captured in all its natural beauty by Perth photographer Sarah Tonkin. 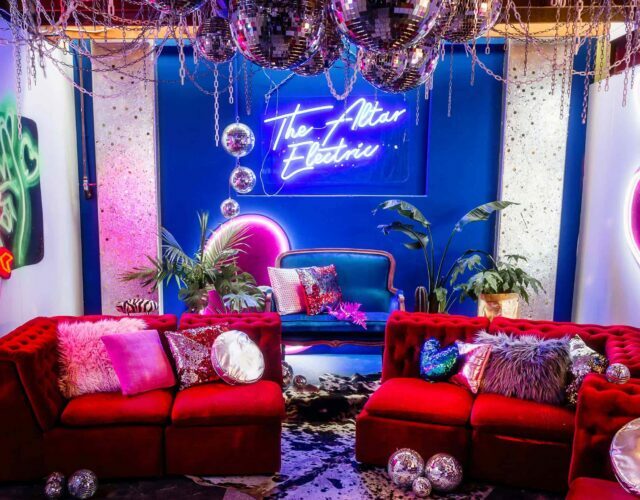 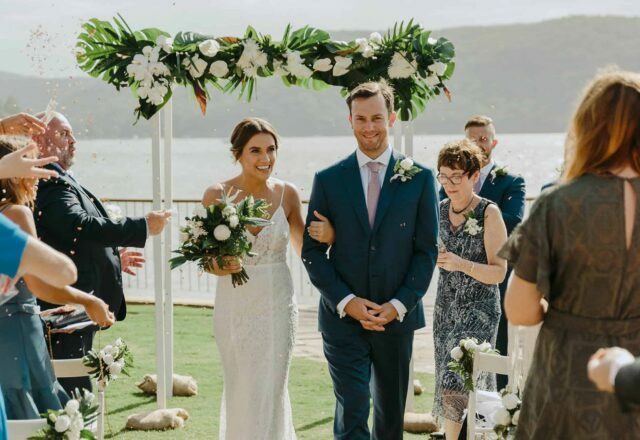 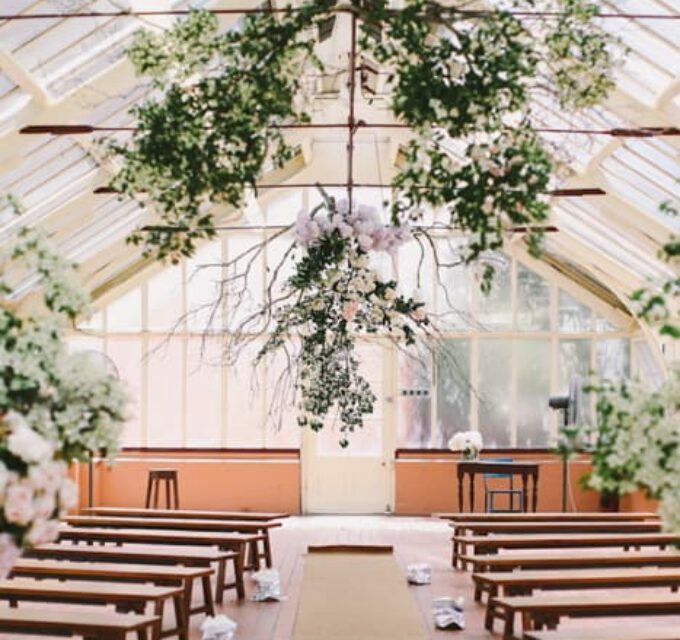 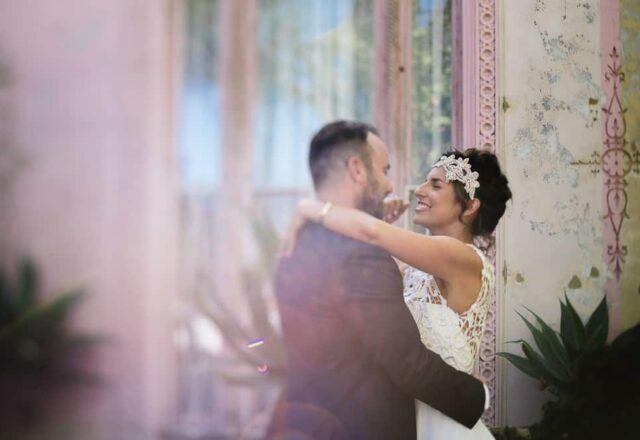 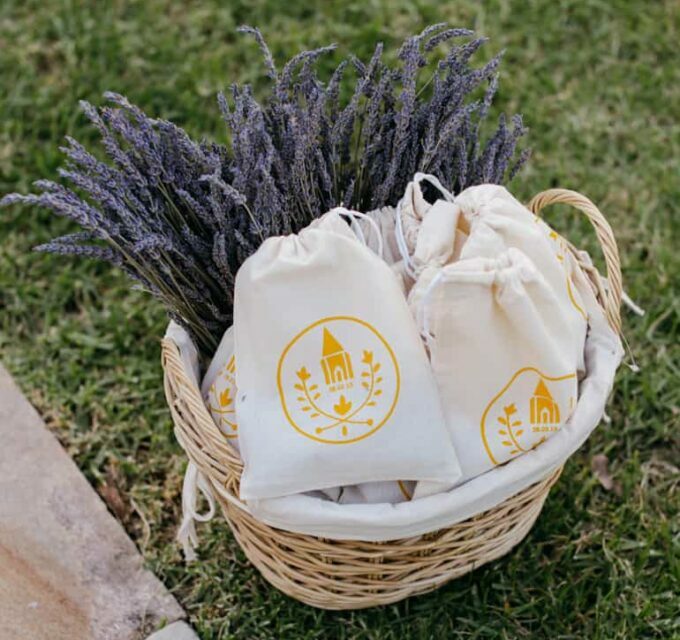 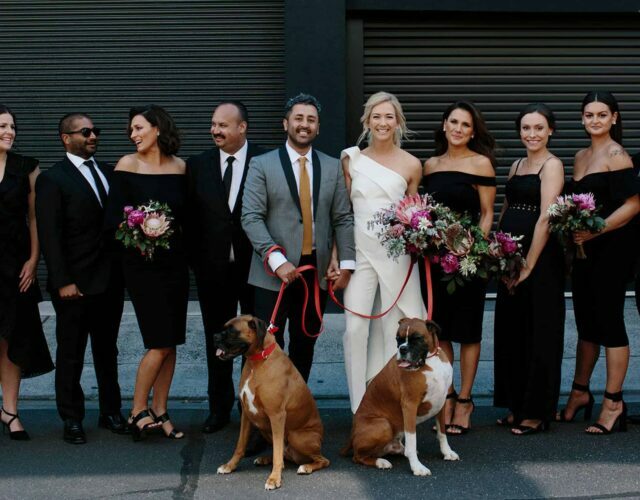 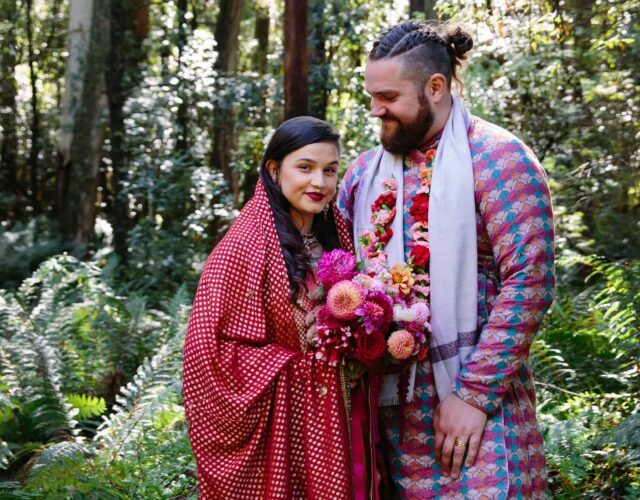 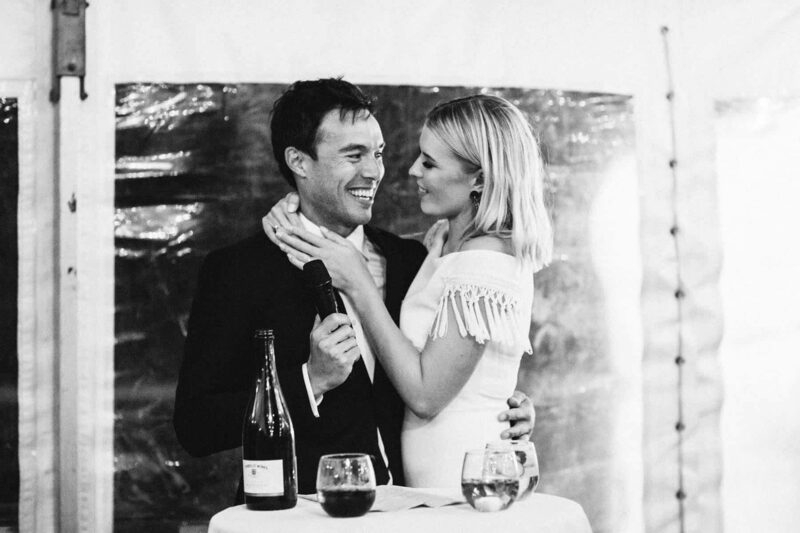 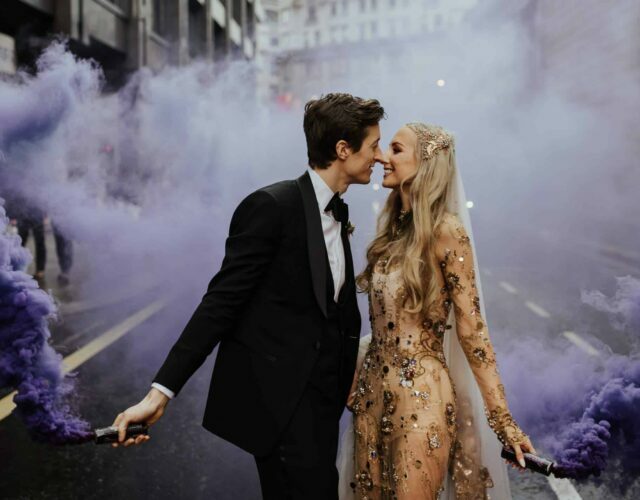 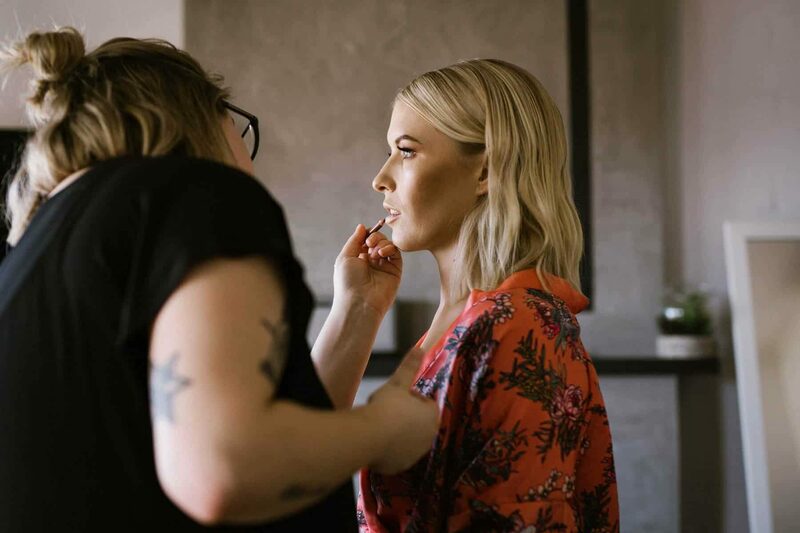 Lara shared “The ceremony was amazing – the vibes were so calm but powerful, we were both nervous for our vows and when the time came it was like it was just the two of us at that moment”. 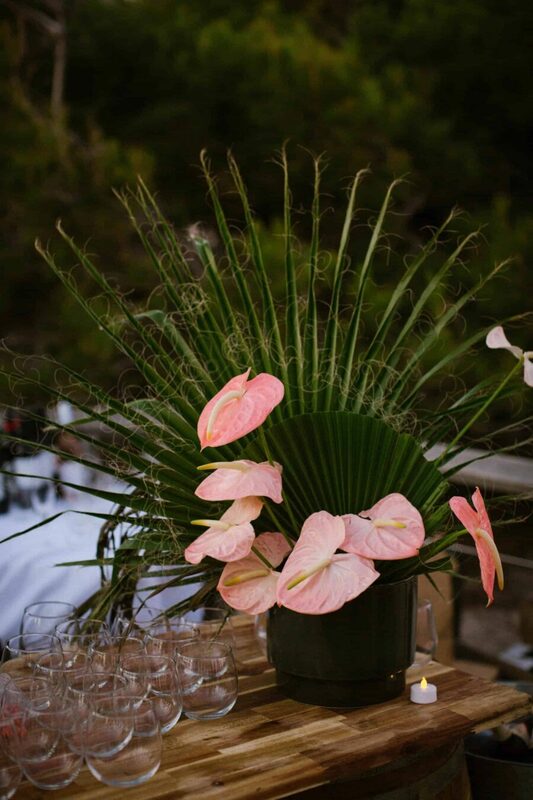 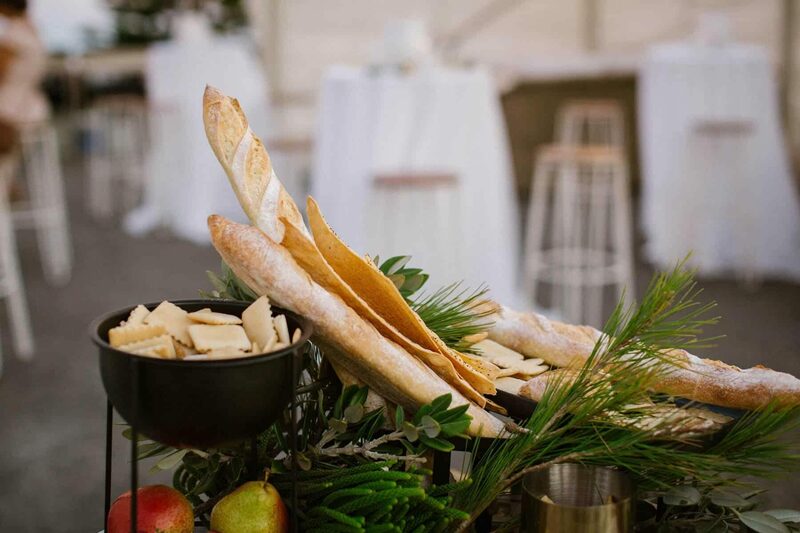 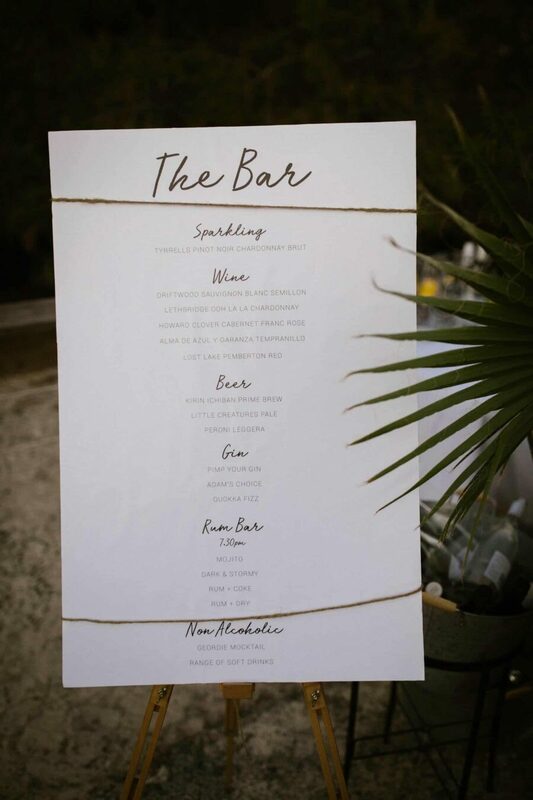 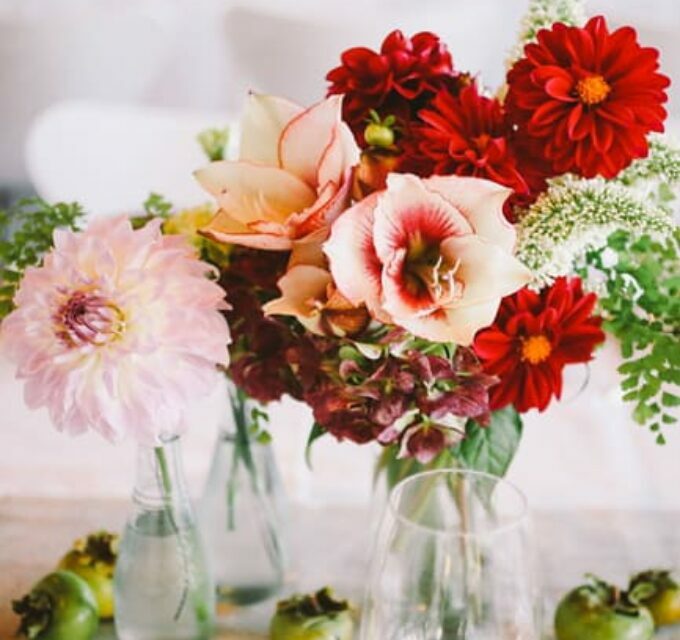 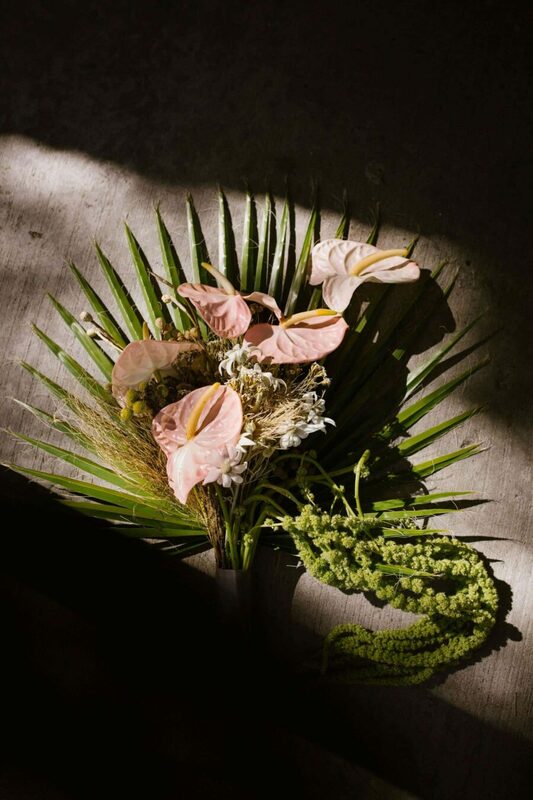 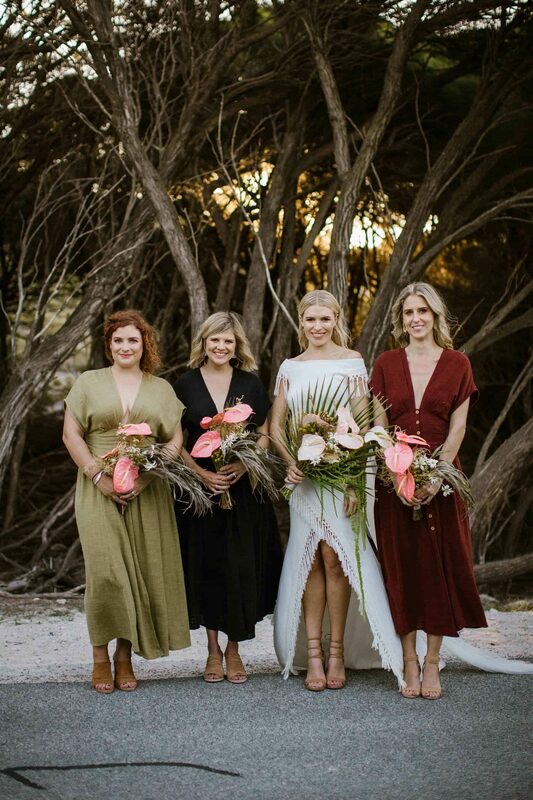 The bride was in charge of styling and allowed the natural elements to play a starring role, using earth tones that flowed harmoniously with the island setting. 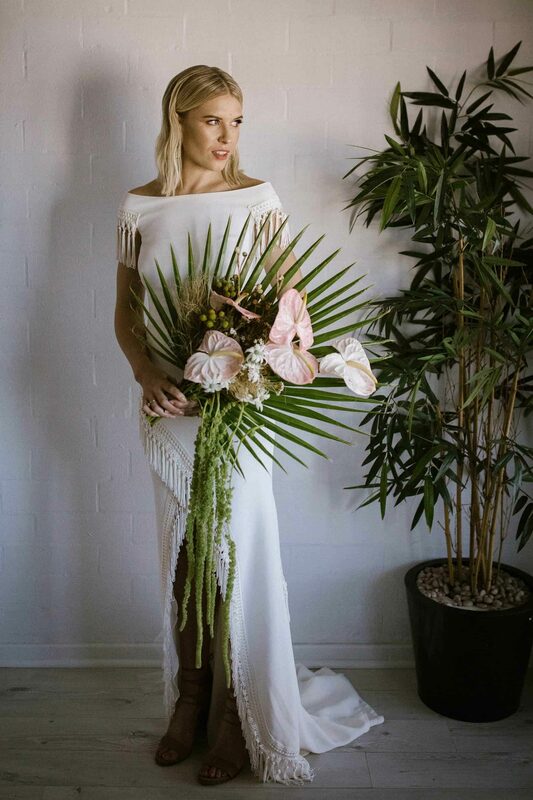 In contrast, Lara’s bridal look was modern with a chic, off-shoulder Rue de Seine dress with a high cross hem and gorgeous tassel fringe. 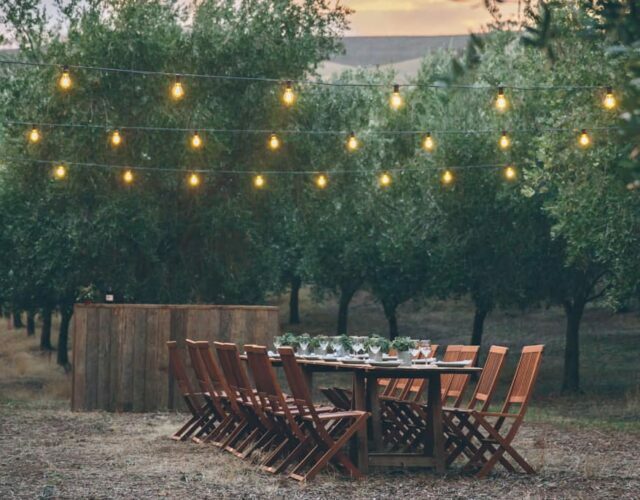 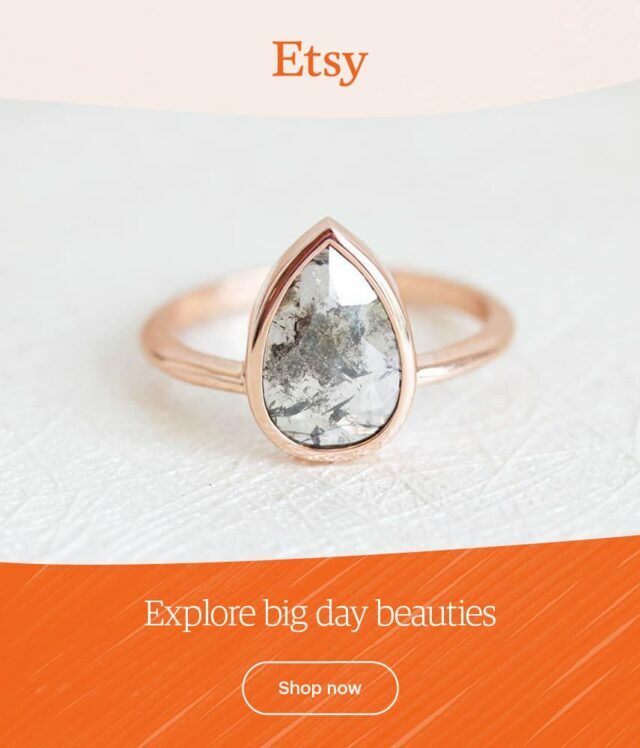 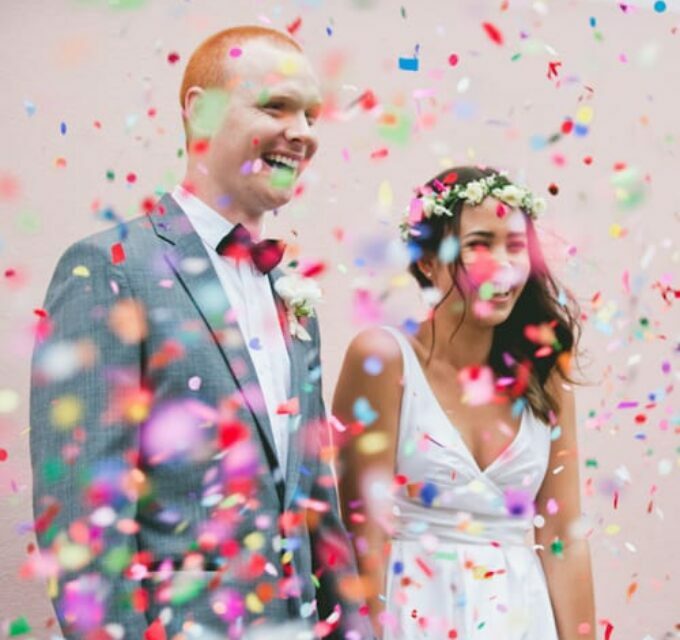 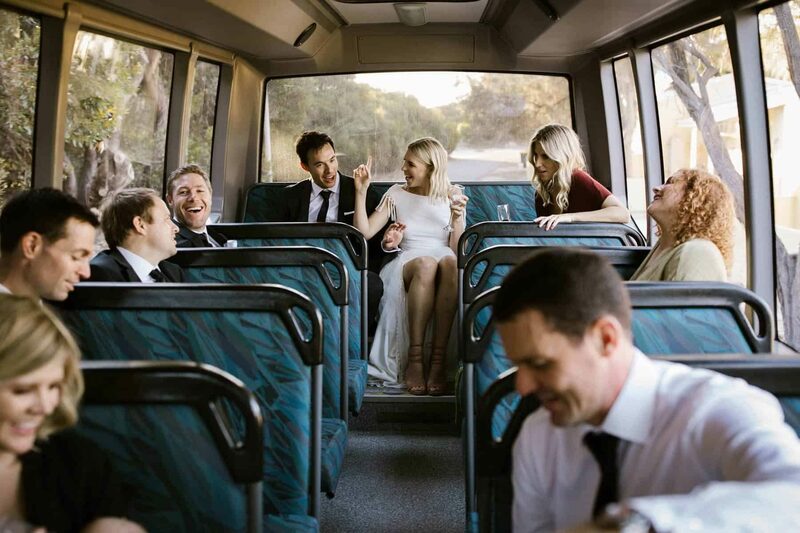 For others about to tie the knot, these guys have some great advice, “On the day, just roll with it, don’t think of yourself as a host, behave like a guest. 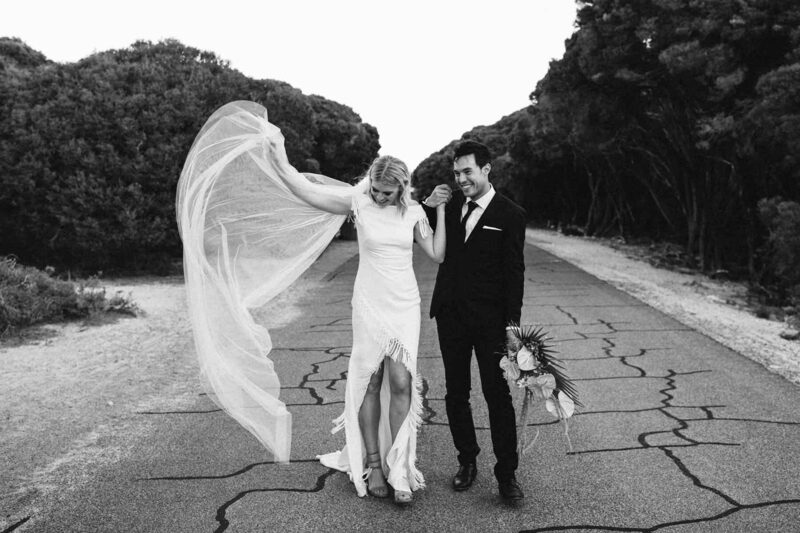 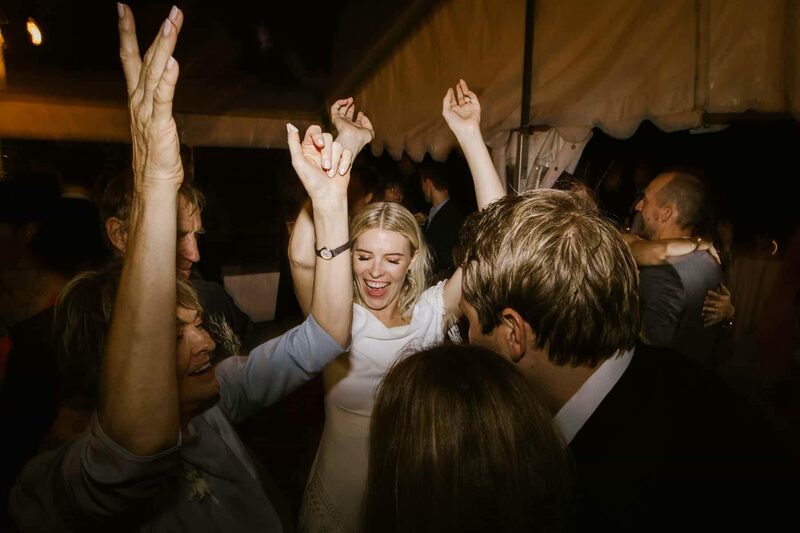 We’ll admit to being a little obsessed with Lara’s tasseled Rue de Seine gown! 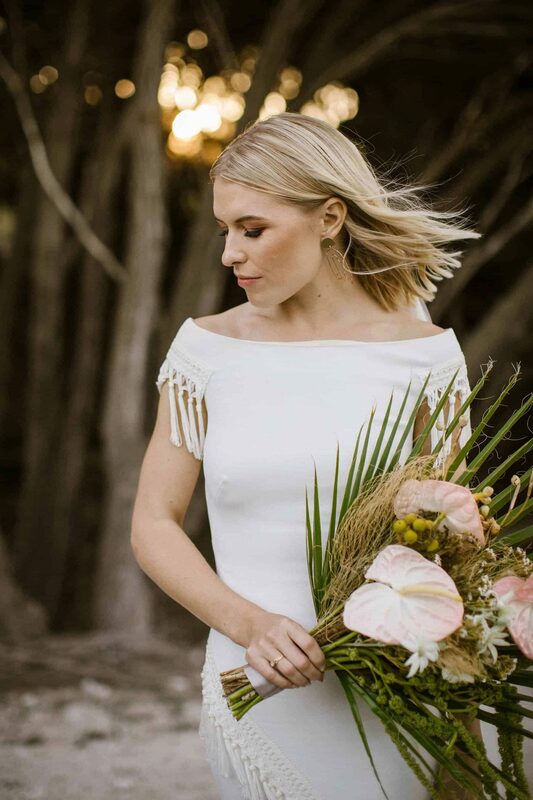 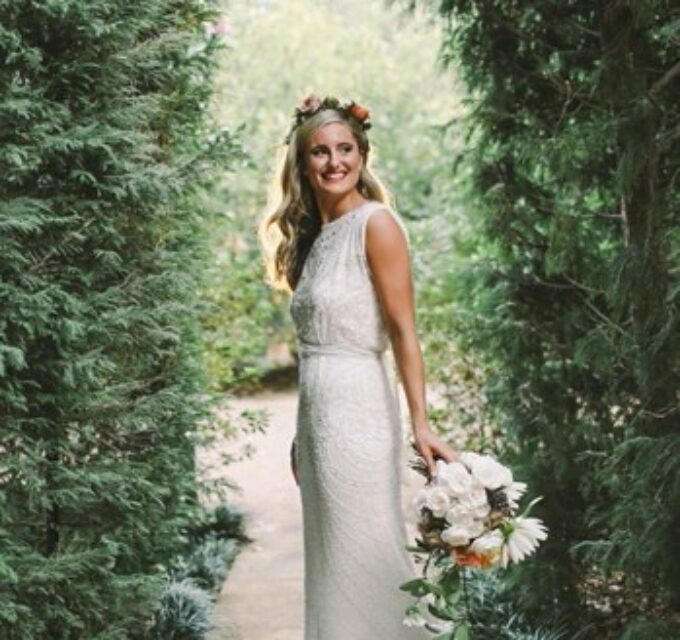 Tropical blooms by the groom’s sister and natural hair and makeup by Jaimee Lee and Tori Overstone completed her fresh bridal look. 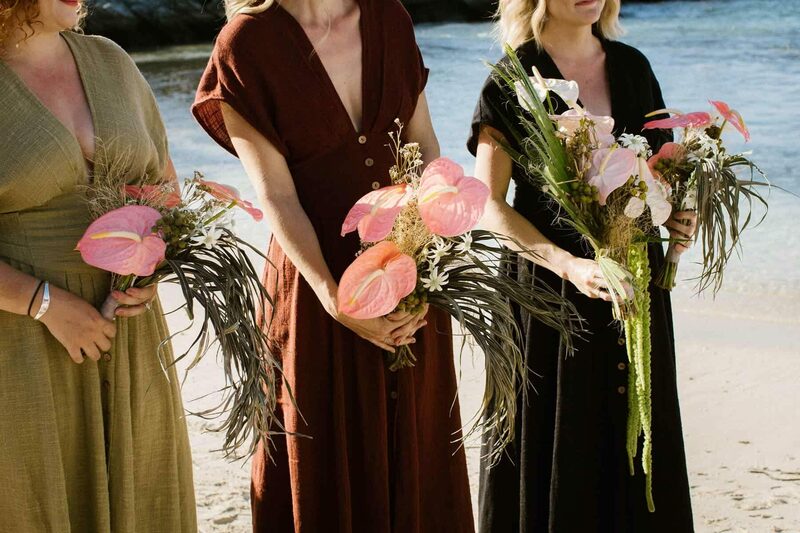 Lara’s bridesmaids donned flowing maxi dresses from Free People in earthy tones, working perfectly with the natural island setting. 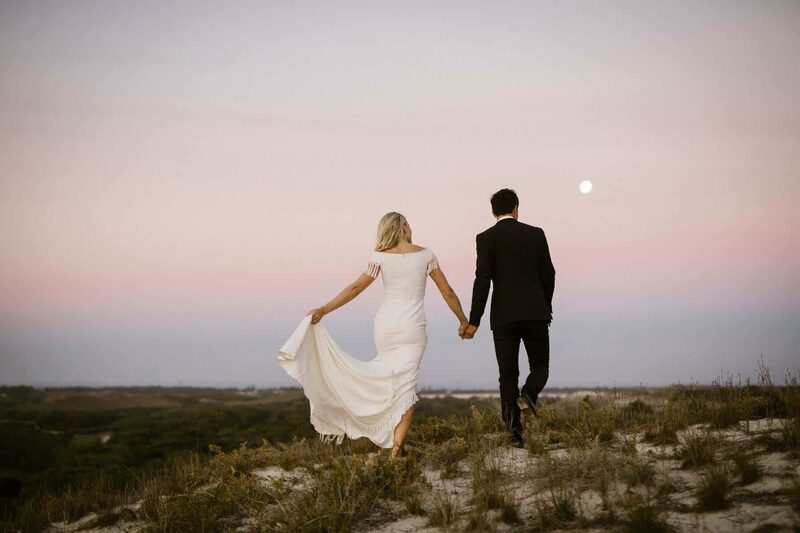 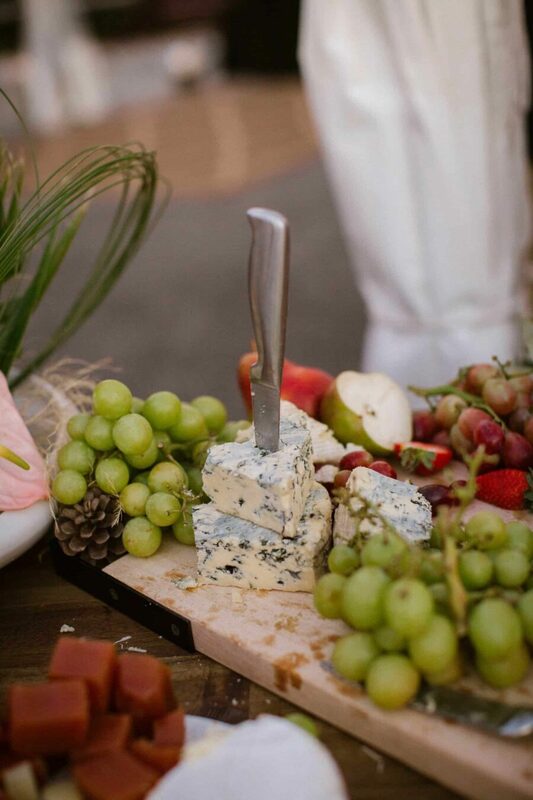 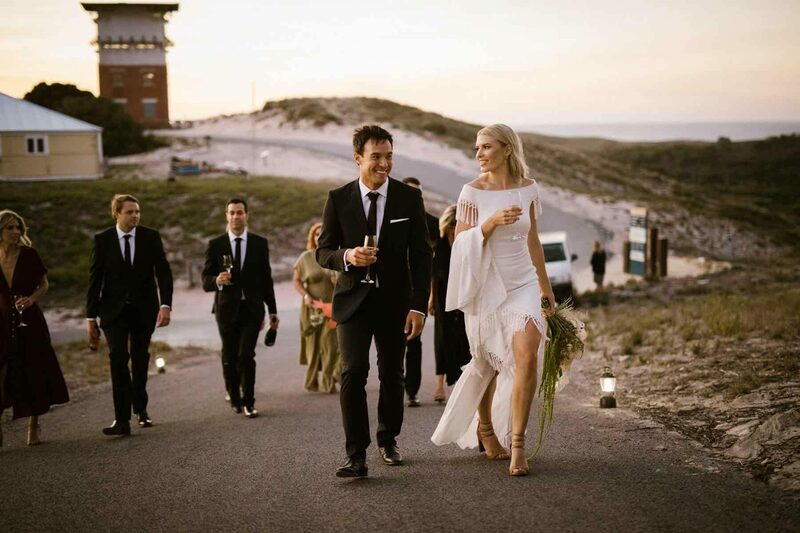 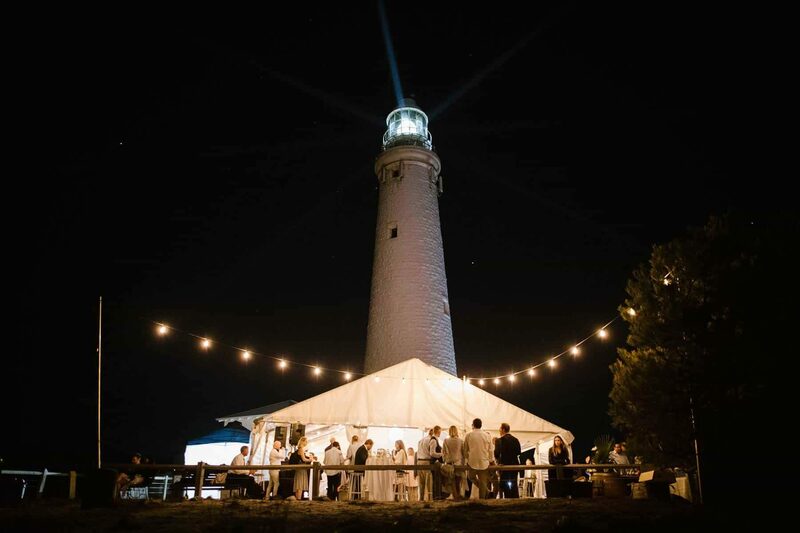 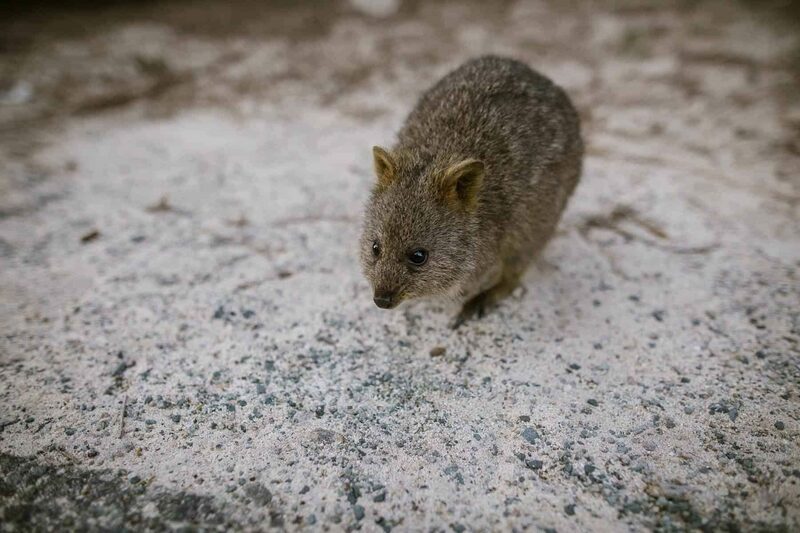 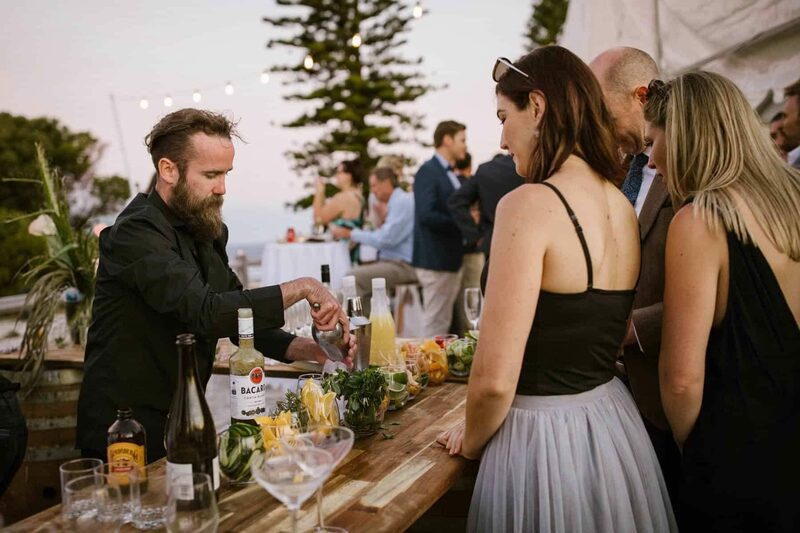 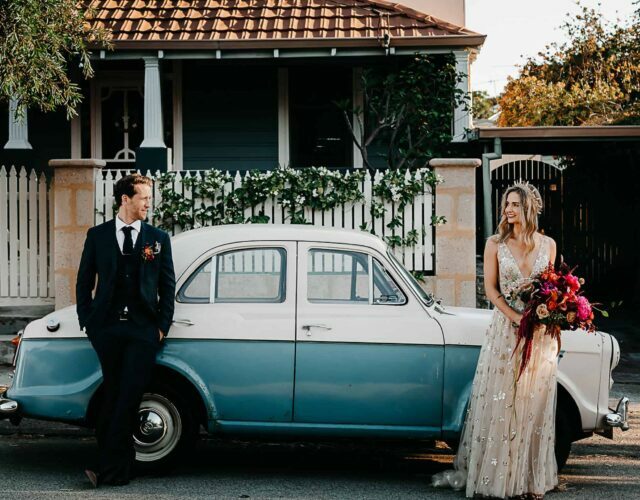 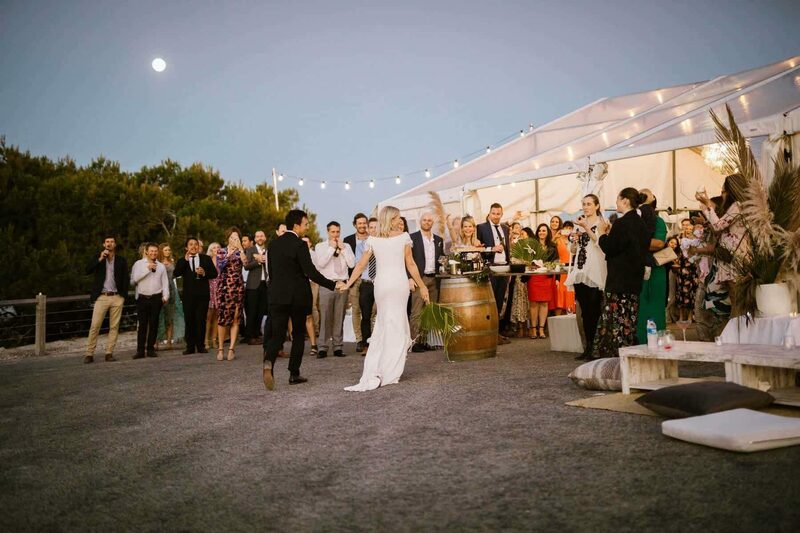 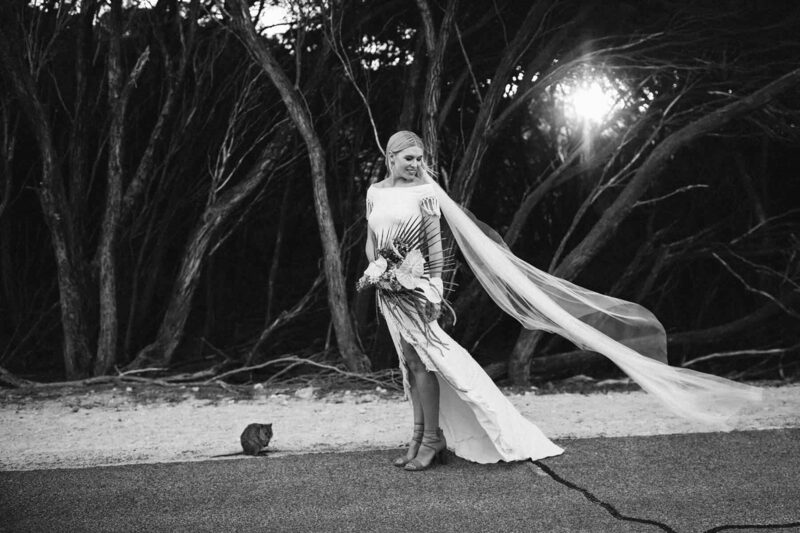 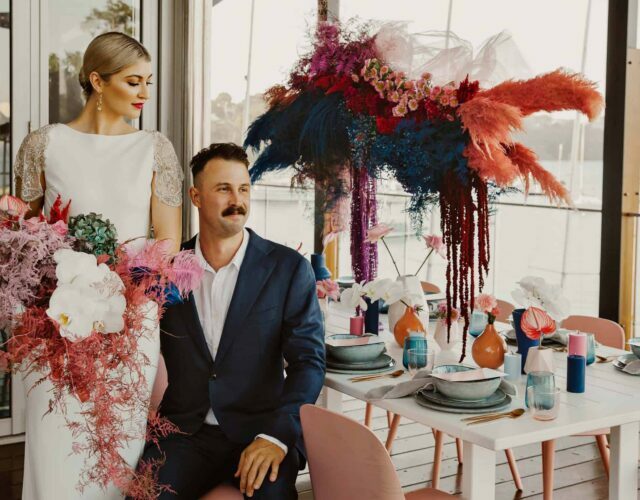 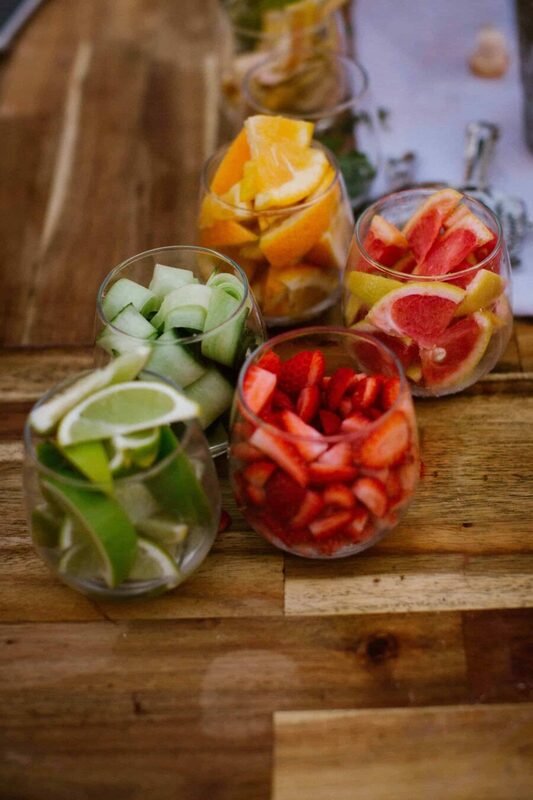 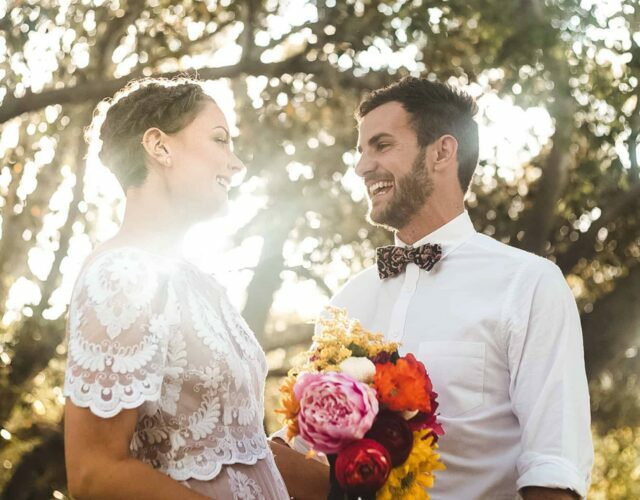 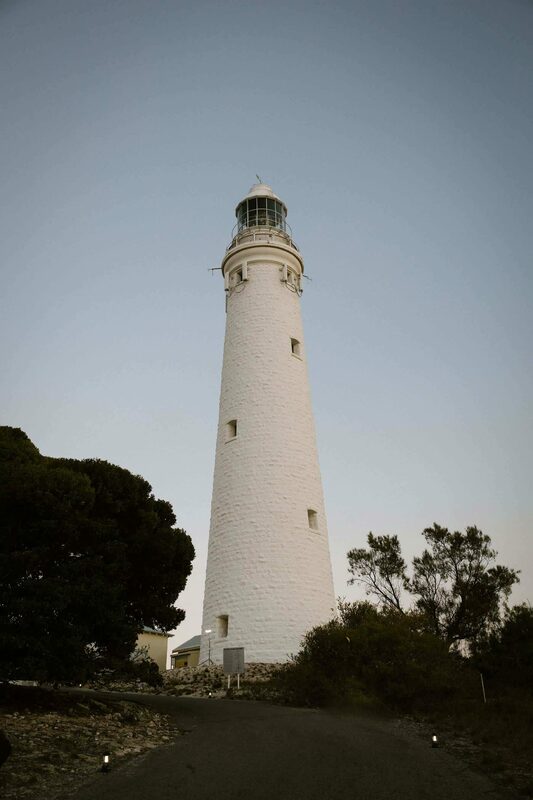 Photographer Sarah Tonkin popped over from Perth to capture all the island shenanigans, from the gatecrashing quokkas to the loved-up newlyweds dancing under the rising moon. 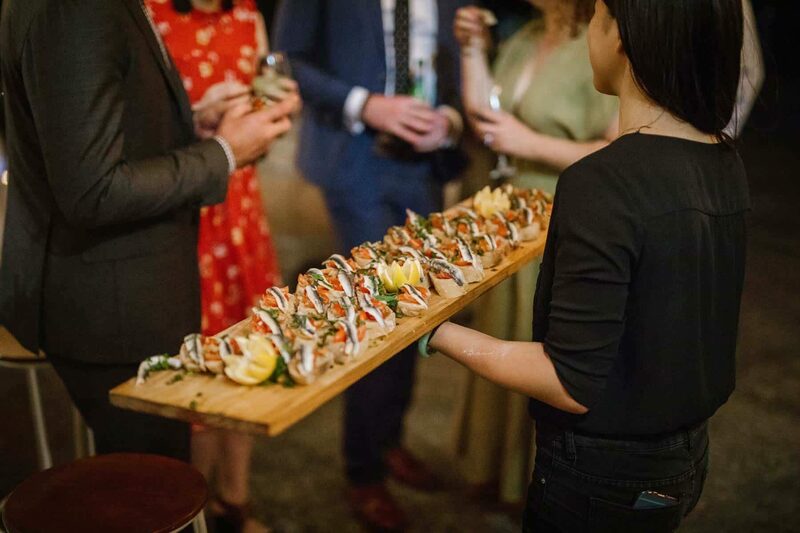 Canape style grub was served throughout the evening by Olé Paella Catering, while gin cocktails and a late night rum bar kept everyone well oiled and on the dance floor.